WHO’S THE MOST DIFFICULT TO DEAL WITH: NAOMI OR PARIS? If there was an “Oscar” for being the most difficult to deal with, who would win: Paris Hilton or Naomi Campbell? Paris Hilton (born on 17th February 1981 in New York City) was born into a wealthy family and quickly got used to a life of luxury and glamour. She is the granddaughter of Barron Hilton, founder of the “Hilton Hotel” franchise. In her youth, she moved between exclusive homes in “The Hamptons”, which is located outside New York City. 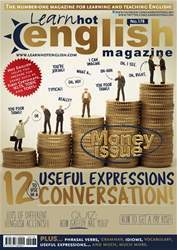 The latest issue of Hot English (178 – the March issue) is out now! Learn over 300 useful words and expressions and improve your listening skills with Learn Hot English! This month: Improve your spoken English! Learn 12 useful expressions for responding to comments + 10 “money” words, 8 useful maths terms, 16 words to use to describe films, 10 expressions for describing an object, 20 “furniture” words... plus: • Quiz – are you greedy? • Food – unusual restaurants • Grammar – the use of the word “like” • Books – Twilight book review • Cinema – a film extract from Dead Poets Society • Finance – famous billionaires • History – the Great Depression • Celebrities – Paris Hilton versus Naomi Campbell • Culture – an Indian festival • Entertainment – learn how to play poker • Crime – the Ponzi Scheme • Phone English – ordering something by phone • Language – the second English language: Globish • Money – some great money quotes • The environment – the rise of the Scuppie • Education – classroom phrasal verbs AND LOTS, LOTS MORE! By reading and listening to all this great content, you'll improve your English reading and listening skills and learn up to 300 useful words or expressions. Plus, you'll get a better job and pass English-language exams more easily. Guaranteed! 12 TO USE IN A USEFUL EXPRESSIONS CONVERSATION!